JUPITER can be seen in the early evening till early morning this month. At 8pm, look east, half way between the horizon and zenith (overhead), you'll see a bright white 'star'. This is Jupiter. If you have a binoculars, you should be able to see up to four 'stars' at the side of Jupiter, forming a straight line. These are Jupiter's moon; Io, Europa, Callisto and Ganymede. Not to worry, if you can't see all four. Sometimes, they hide behide Jupiter or go in front of it, render them almost invisible. With a small telescope, you should be able to see the belts of Jupiter. At least two of them can be seen. They appeared to be brownish in colour. 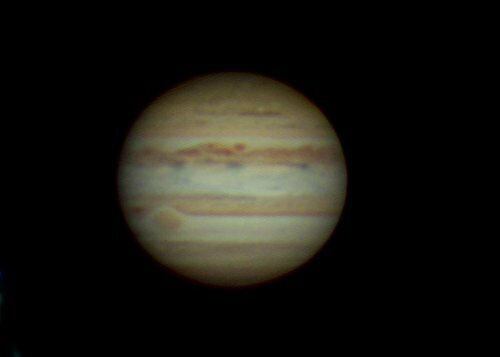 With medium size telescope, you can try to look for the Great Red Spot. This is a hurricane like storm that is a permanent feature of Jupiter since the invention of telescope. It is about twice the size of the Earth. This is the photo of Jupiter taken on the 12th September 2009 with Canon 450d camera and 8" telescope. The Great Red Spot can be seen rotating into view at lower left of Jupiter. On 30th September, the Moon will be 4 degrees next to Jupiter. The other nice planet that you can see is Mars, rising around 2.30am. But do start to find it at that time. You'll need to give it enough time to rise higher in the sky. You best time to see Mars in September is around 5am when it has risen half way to zenith in the eastern sky. It will appear red in colour. A word of caution here. Don't expect Mars to be very prominent now. It is still very far away from Earth at this moment, thus appearing very, very small. The best time to see Mars will be in January 2010. At that time, it will be twice as big as it is now. Even then, it will still be 'small' to most of us. In the early morning before Sunrise, you may be lucky to spot Venus. At 6.30am, it will be very low in the Eastern sky. If you have a good sky, you won't miss this planet, as it is very bright and white in colour. Many thought it was a satellite due to its brightness. It will sink closer to the horizon each morning. So, your best chance to see it is now. A few months from later it will appear in the evening sky instead of morning. The New Moon will be on the 19th this month. On this day at Sunset, the Moon will be only 3 degrees above the horizon, when the Sun set. It will be too low to spot the 'anak bulan'. If you look West at 9pm, you can see the constellation of Scorpio about to set. If the sky is good, you should be able to see many stars around this region. This is because we are looking at the center of our galaxy, the Milky Way. 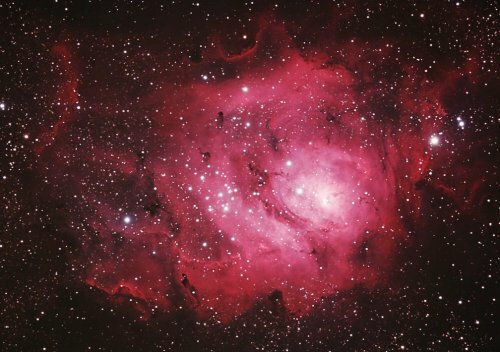 A binoculars will enable you to see many nebulae and star clusters such as Lagoon Nebula, Butterfly Clusters, Wild Duck clusters and many more. At 10pm, in the East, the nearest and brightest galaxy is rising. This is the Andromeda galaxy. If you know its exact location, you can see it with your naked eye. With a bino, you can definitely see its 'UFO' like shape, typical of a spiral galaxy. 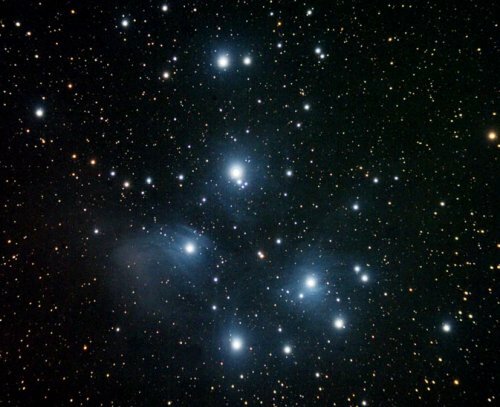 Past midnight, beautiful star clusters and nebulae started to be visible such as the Seven Sisters Clusters, also known as Pleiades. The great orion nebula will also be visible a few hours later.